In 1967, Frank Dance proposed the communication model called Dance’s Helix Model for a better communication process. The name helical comes from “Helix” which means an object having a three-dimensional shape like that of a wire wound uniformly around a cylinder or cone. He shows communication as a dynamic and non-linear process. Dance’s model emphasized the difficulties of communication. 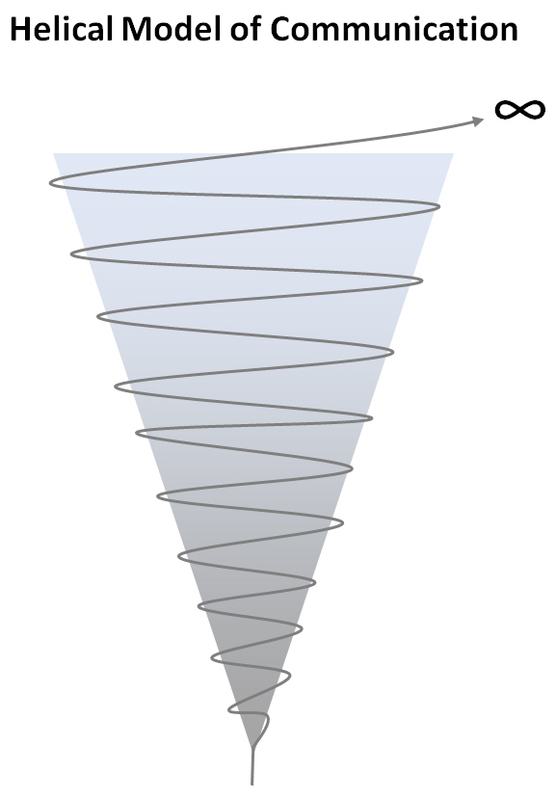 Frank Dance uses the form of a Helix to describe communication process. He developed this theory based on a simple helix which gets bigger and bigger as it moves or grows. The main characterstic of helical model of communication is that it is evolutionary. Frank Dance explains the communication process based on this Helix structure and compares it with communication. In the Helix structure, the bottom or starting is very small then it’s gradually moves upward in a back and forth circular motion which form the bigger circle in the top and its still moves further. The whole process takes some time to reach. As like helix, the communication process starts very slowly and defined small circle. Communicators share information only with small portion of themselves to their relationships. Its gradually develops into next level but which will take some time to reach and expanding its boundaries to the next level. Later the communicators commit more and share more portions themselves. When a child is born the only means of communication is crying, he/she cries for everything like hunger, pain, cold etc.. As the child grows the means of communication become wider and broader. He learns to makes noises then he learns language to obtain attention and to fulfil his needs. As a Helix the process of communication in this case started from crying and later it developed into a complex and compound means. The Helical model of communication is largely dependent on its past. A child learns to pronounce a word in his elementary classes and throughout his life he uses that word in the same way he learnt. Just like that we used to react to certain things in a certain way in our childhood and such reactions and habits lasts with us forever. The communication evolves in the beginning in some simple forms then the same process of communication develops based on the past activities. It develops further with modifications. Frank Dance included the concept of time in his theory. Something happens over the other will always be based on the first event according to him. This theory of communication was a subject to a number of experimental researches. Even though this model of communication clarifies everything there is a problem of over simplification. According to this theory a communication process is the product of what we learnt. Thank for sharing nice Article. Could there be a better example for this theory? Thnks.it realy hlp fr me. Isn’t this a correct communication model? My professor once told us that communication is a two-way process where there will always be a feedback and there is a need for a recipient for the communication to happen. And in this model, there is only one person involved and there is only one-way process. Good stuff, but under which view does it fall? Ritualistic or transmission? .,. the article really helps me to understand the assigned topic that my teacher was given to me. no, this communication process is not done by one way communication. The actual communication process happens when the feedback is achieved by the recipient/s. In this structure the continuous sociability, acceptability , and expansion achieved through the continuing transmission and transcendental experience reached by the communicator or sender. But the unique specificity of this model is rendered here as the movement towards infinity, means, through cognitive knowledge obtained from environment by gaining sustainable experience. Is this the same as The Spiral Model of Communication? Helical can also be applicable in case of Gossip… with no beginning no end concept. How a gossip is born, evolve, grow bigger and bigger with involvement of more and more people… and how gradually it disappears. researchers need more detailed information. its true to say that communication acts like a spiral going upwards; but you left behind the people involved in this type of communication. you also dint point out the elements that are involved in this type of a model. in my own words ,i can say that a model is a formulae used by people in communication to air out information. recheck the package and give us a detailed one. What about the criticism of this model ?